(HOBART, Okla.) – The General Tommy Franks Leadership Institute and Museum tributes service members on National POW/MIA (Prisoners of War/Missing in Action) Recognition Day. The day is recognized annually on the third Friday of September and is commemorated this year on Sept. 15. “We are dedicated to honoring our service men and women and reminding Americans of the daily sacrifices they’ve made in securing and protecting our freedoms and liberties,” said General Tommy Franks. National POW/MIA Recognition Day is set aside to honor the commitment and sacrifice made by this nation’s prisoners of war and those who are still missing in action, as well as their families. On July 18, 1979, Congress passed a resolution, public law 95-349 “National POW/MIA Recognition Day,” to annually honor POW/MIAs. In July of 1979, a poster was published by the Veterans Administration which contained only the letters POW/MIA. This was replaced in 1982 by a black and white drawing of a prisoner of war in captivity with the words “YOU ARE NOT FORGOTTEN” across the bottom. Today, this drawing is recognized as the national POW symbol. The first national POW/MIA recognition ceremony was held at the National Cathedral in Washington D.C. During the ceremony, the First Tactical Squadron from Langley Air Force Base in Virginia flew the Missing Man Formation. This formation is an aerial salute performed as part of a flyby of aircraft at a funeral or memorial event. Four aircraft fly by in a diamond formation while one aircraft drops out of formation leaving only three. The fourth aircraft represents “the missing man” and honors the military person. After primarily being conducted at the Pentagon, National POW/MIA Recognition Days are held on military installations and ships throughout the nation and around the world. Admission to the General Tommy Franks Leadership Institute and Museum is free. The Museum is open Monday through Saturday from 10 a.m. to noon and 1 to 5 p.m. For more information or to learn more about the Museum, please visit TommyFranksMuseum.org. 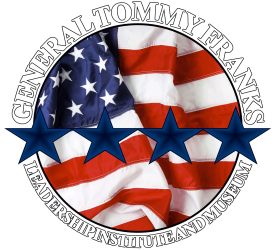 ​The General Tommy Franks Leadership Institute and Museum was created as a historical foundation dedicated to telling the story of the United States military and education. Its mission is to advance the development of this world class leadership training institution and museum. For more information, visit TommyFranksMuseum.org.